India is a country which is divided among various provinces, cultures, and languages but united by its festivals. Each state of India celebrates at least one festival from where the reason to celebrate might have originated from historically. Being a part of the festivals in India brings you closer to understand the rich tradition that they have been following since generations. 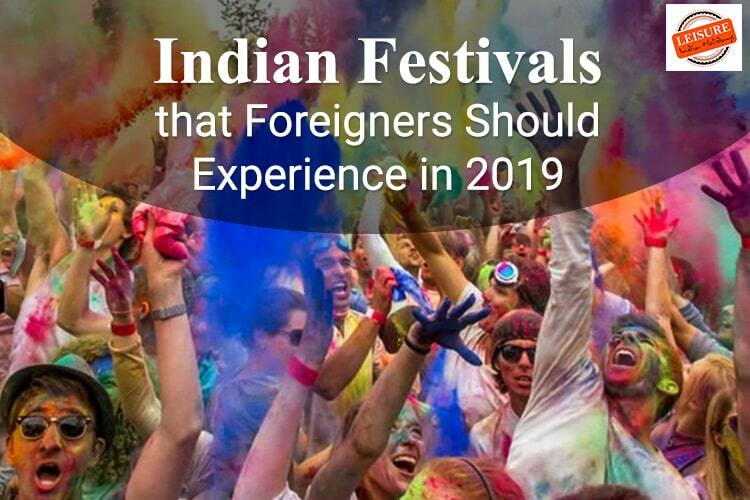 This festival is celebrated with different names across India, for example, Pongal in South India, Lohri in Punjab and Haryana, Bihu in Assam and Khichdi Festival in Bihar. This Festival signifies the end of darkness and the beginning of new chapters in everyone’s life. Makar Sankranti is predominantly celebrated in Gujrat which is also known as the famous kite-flying festival of India. People gather to fly kites that relate to the emotional state of brotherhood and happiness. There are kite flying competitions conducted which brings in people together from different areas of life and culture. In households, women prepare sweets made out of Til ( Sesame Seeds ) with sugar or Jaggery, Farsan and worship the Sun God. Whereas Lohri in Punjab is celebrated by making a huge bonfire. 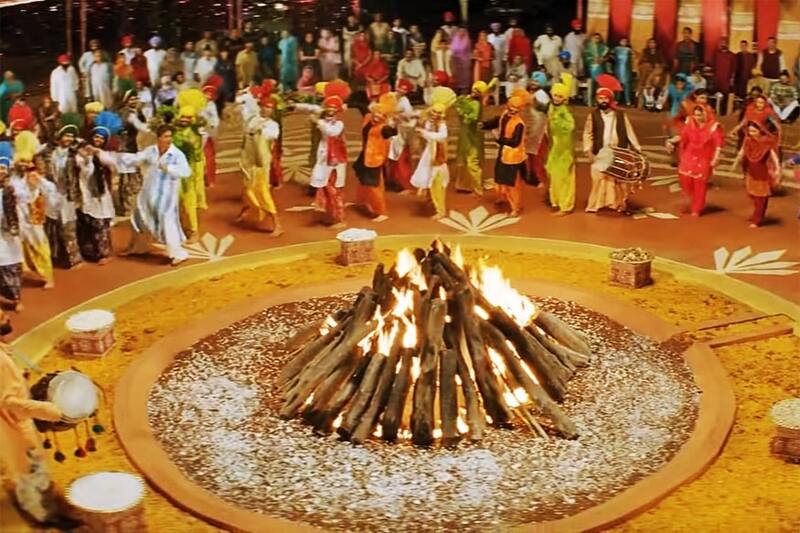 People circle around the bonfire and offer rice or wheat in it. Pongal which also means Spilling over in South India lasts for 4 days. Rice is boiled till it overflows from the pot. People celebrate it by drawing of kolam and cooking delicacies made out of Pongal. Bihu is the prime most festival of Assam which is celebrated by performing the famous folk dance named after the festival Bihu. The khichdi festival in Bihar is celebrated by preparing Khichdi ( Rice porridge) and visiting temples. Historic Origin: Marks an end to the winter solace, Celebration to welcome longer days, Transition of negative to positive time after Uttarayan. Celebration: Kite festival, Bonfire, folk dance, delicacies made of rice, sesame seeds, sugar, and jaggery. Places to Visit: Gujrat, Punjab, Assam, Bihar and South India. Holi – 21st March ( Thursday ) 2019. 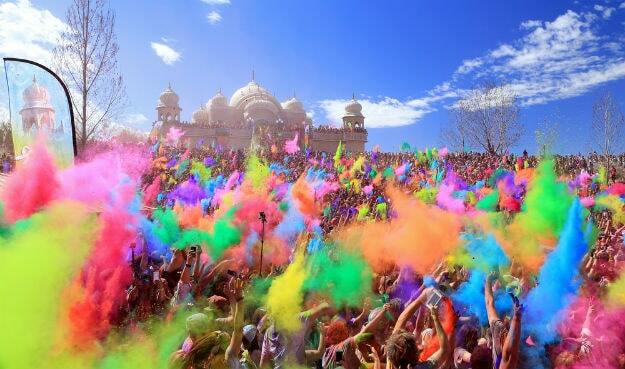 Holi festival is the celebration of love, color and loads of fun. This festival is celebrated by burning Holika ( Bonfire ) a night prior to the Holi eve. Holi is celebrated as a victory for Prahlad, son of Hiranyakashyap over Holika ( sister of Hiranyakashyap) who jumped with him in the holy fire on the demand of her brother Hiranyakashyap as she was blessed to enter blazing fire without damaging herself. Hiranyakashyap was a cruel king and wanted to be worshiped by his kingdom as a god to which his son Prahlad revolted and worshiped Lord Narayan instead. Prahlad returned back from the fire without any harm, whereas Holika was burnt to death. That’s where Holi gets its significance of celebrating goodness over evil. The other story that relates to Holi is Lord Krishna use to apply colors to his beloved Radha while they played and in return, Radha and her friends use to beat him and his friends with sticks which started as the famous Lathmar Holi Tradition which is one of the various types of Holi celebration in India. The best place to visit India for Holi is Mathura and Vrindavan the origin of this festival as its also known as the birthplace of Lord Krishna. Holi in Mathura and Vrindavan is played in the most authentic style. People from all over the world visit Vrindavan to be a part of this festival making it once in a lifetime experience, where one can experience the real aura of celebration where men and women dress as Lord Krishna and Radha and throw colors ( Gulaal ), flowers along with performing the Lathmar ritual in which the girl beats guys with sticks. Historic Origin: Victory of goodness over evil, the festival of love and fun. Celebration: Playing with colors, performing the Lathmar ritual, Preparing Thandai and Bhang. Places to Visit: Vrindavan, Mathura, and Rajasthan. This is one of the most important festivals of Maharashtra which lasts for 10 days is celebrated to welcome the elephant-headed Lord Ganesh on the occasion of his birthday. Lord Ganesh is worshiped as the lord of success and destroyer of evil and obstacles. This festival is celebrated with great pomp and show in Maharashtra. Devotees bring Ganesh idols in their house and worship the Idol with Diyas, and his favorite food called the Modak. He is welcomed in the house with a lot of love and stays with the family for 10 days as a part of the family member. Houses at this time are decorated with lights and mandals. Huge Ganesh Idols can be seen worshiped on the pavements and housing societies. One can feel the vibes of the festivals when places are brightly lit, music and gatherings flood these mandals with belief and love for the lord. Alibaug cha Raja in Mumbai is considered to be the most visited Ganesh Mandal in Mumbai. This Mandal is visited by a lot of Bollywood celebrities, politicians and businessmen making it the most famous Ganesh Mandal in Mumbai. On the 10th day of the festival, the immersion of Lord Ganesh in water takes place with a belief of him returning back the next year. Many documentaries about the preceding of these festivals have been shot. 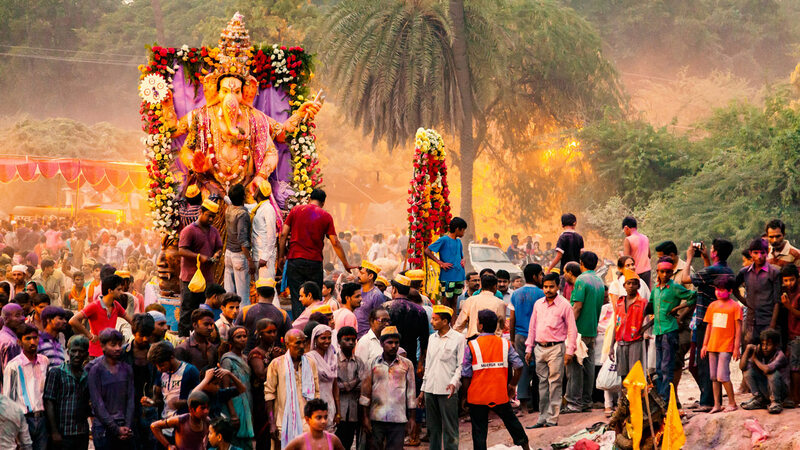 This festival surely has to be on the list while you visit India. Historic Origin: Visit of the deity Lord Ganesh to his devotees on the occasion of his birthday. Places to Visit: Maharashtra, Mumbai and Andhra Pradesh. Navratri which means nine nights, its a festival devoted to Goddess Durga the goddess of power and victory. Navratri is popularly celebrated in Gujrat whereas as its known as Mahalaya in Kolkatta. 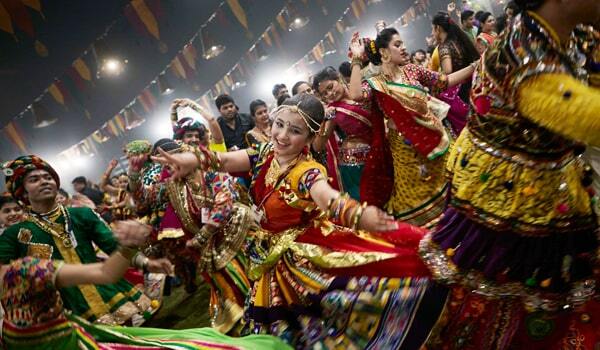 The rich cultural essence of Gujrat can be felt in these nine days of Navratri. People fasts during these nine days and perform Garba and Dandiya in the evenings on the tunes of Gujarati folk music and Bollywood songs after worshiping the Goddess. Women look gorgeous in the traditional outfits called Chaniya Choli which has the mirror and bright colored thread work on it. Whereas men are seeing wearing chorno ( Cotton Pants ) and Kediyu ( shirt ). Gujrat is decorated all over, attracting tourist and visitors from all over. Similarly, Mahalaya in Kolkatta which lasts for seven days holds another outlook of worshipping Goddess Durga. Mahalaya is celebrated on the occasion of the victory of Goddess Durga over Buffalo king Mahishasura ( the demon ). Here the Pandals ( where the goddess is worshiped ) is decorated with lights and food. The landowner families have been carrying out the puja’s for centuries and the most famous ones are in Sovabazaar Raj Bhari and Rani Rashmoni Bari. Historic Origin: Celebration of the victory on evil, a celebration of womanhood. 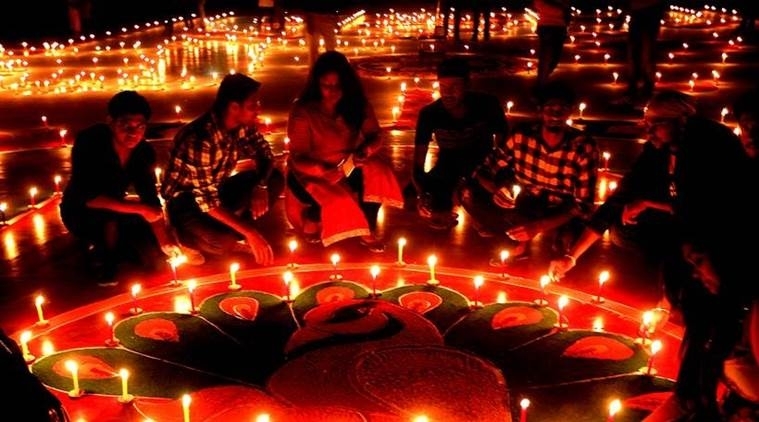 Diwali is also known as the festival of lights which is celebrated all over India and among Indians around the world. This festival celebrates the victory of Lord Ram over Ravana as he returns Ayodhya after 14 years of exile in the forest. Diwali is also celebrated by worshiping Goddess Laxmi, the Goddess of riches. Indian lights lamps and candles in their houses in order to light up their spirituality and fight against evil, the darkness from within. This festival lasts for 4 days, the third day is the most important one here people burn crackers, worship Goddess Laxmi, visit family and friends and draw beautiful rangoli with colors and flowers.